Dark Triumph picks up during the end of Grave Mercy. I had liked Grave Mercy, but didn't remember much. Thank you to the recaptains for having a summary. The books are a historical fiction about the events in the country of Brittany and focuses on a group of assassins. The first book followed Ismae, as she tries to assist the young ruler of the country. She ran into her fellow assassin Sybella during the book, but was not able to find out what she had been up to. 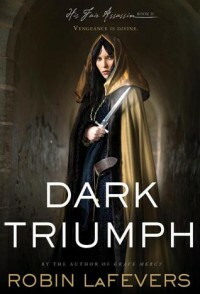 In Dark Triumph, we learn why Sybella had been so mysterious and where she was getting her information from in the last book. Her mission also puts her in the path of Beast, a monstrous man who became a friend and ally of Ismae in the first book. I really enjoyed this book. The relationship between Beast and Sybella was a joy, despite the darkness of the story. I'm not sure what will happen in the last book, since based on the notes from the end of the book, the author has adpated most of the historical incidents that drove the first two books. But I look forward to reading it.